See the updated report here. MAPS UPDATED MARCH 8. On Super Tuesday, 11 states had primaries or caucuses for each of the two main parties. Front-runners emerged. For the Democrats, Hillary Clinton is leading. For Republicans, Donald Trump is ahead. Candidates were assigned colors. Colors were mixed in the exact percentages of the voter totals for each contest to date for visual comparison. Each state was colored according to the mix. 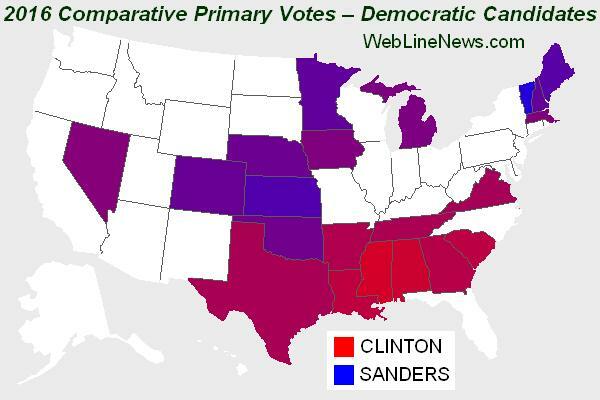 The more red a state is, the better Hillary Clinton did. The more blue, the better Bernie Sanders did. The purest purple is a tie, with Iowa being the closest example. For Republicans, there are three leading candidates. The total vote percentage of all three was combined and each candidate was assigned a comparative percentage of that total. Other candidates were not included. Donald Trump was assigned red, Ted Cruz was assigned green. Marco Rubio was assigned blue. With a three-color mix, a very interesting map of colors emerges. The reddest state, Massachusetts, is where Donald Trump did the best. The greenest state, Texas, is where Ted Cruz did the best. The bluest state, Minnesota, is where Marco Rubio did the best. Between these extremes is a sea of shades, mostly brown. See the guide at the bottom of the chart. The color boxes represent what would be seen where the candidates came in first, second and third respectively. There are two shades. The shade to the left is a blowout win. The shade to the right is a more balanced race. As the colors of all three candidates mix, pure brown signifies a strong showing by Donald Trump with Ted Cruz in second while dark purple indicates a Donald Trump win with Marco Rubio in second. South Carolina has Cruz and Rubio about tied. In both Tennessee and Georgia, Donald Trump received about 39 percent of the vote. Tennessee leans more toward pure brown because Ted Cruz came in second, Georgia leans more purple because Marco Rubio came in second. In Alabama, Donald Trump won by more, 43 percent, and Marco Rubio came in third, so the state is a reddish brown. The map is full of shades of brown which indicate how well Donald Trump is doing. As brown turns more purple, Marco Rubio is more competitive. As the color heads toward green, Ted Cruz does better. Ted Cruz won the greenest states. Finally, as the color turns toward blue, Marco Rubio is strong. 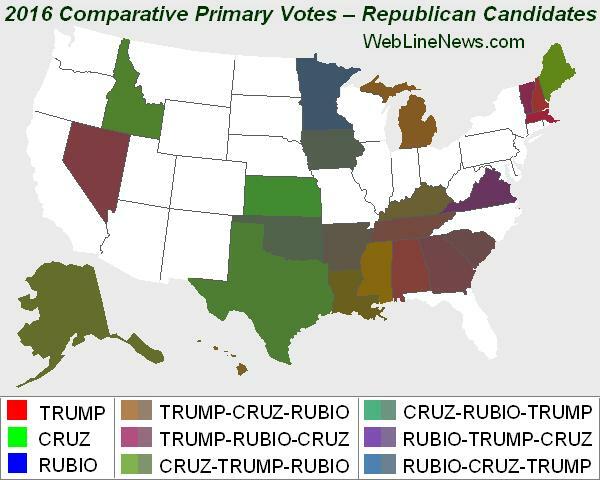 Marco Rubio won only Minnesota to date. While Ben Carson has announced that he will not appear at the next debate, John Kasich has not been counted out. This map will be revisited after more primaries.